The reason can vary for any celebration, But the center of attraction is always a cake! Come, fall in love with the art of cake designing!! A party or celebration is never complete without a cake. It serves as the perfect celebration shooter when you have all the close friends and family members around you. But the most challenging part lies in the art of cake baking and especially its decoration. Everybody wants to surprise his/her loved ones, but the charm multiplies when you get to know that your party cake is home-baked by your close buddies. As far as locations like Delhi, Noida, Gurgaon, and Faridabad are concerned – the markets are loaded with countless cake shops and stores that are ready to do the job for you. Renowned bakeries like ‘Doorstep Cake’ not only offer cake delivery to Noida and adjoining areas but also do the surprising part with midnight cake deliveries. So, even if you are not very good at cake baking or you are falling short of time – you can connect with players like ‘Doorstep Cake’ and get your desired cake delivered right at home hassle-free. Mostly we hear people confessing that they are terrible at decorating birthday cakes. Everyone understands that you might not be able to do wonders with your cake at right – just like the bakery experts do. Nobody expects you to bring a masterpiece whenever required. But presenting an impressive cake would certainly lift up the hearts of your guests. So, if you are willing to go an extra mile and trying to bake a cake for your loved ones at home only, here are a few decorating tips for you. Play with sprinkles:When you are not very good at decorating the cake, it is always recommended to try out the sprinkles. Frost or bake your cake in a regular/common shape (square or round), put cream to it and just throw away the colorful sprinkles. These tiny colorful edible particles are able to give a lively and vibrant look to your cake any day. The best part is, these sprinkles also hide any imperfections to the design. Try Out the Cupcake Design: It is the best alternative to a homemade birthday cake – especially when you are not confident with frosting. Just arrange a bunch of cupcakes in your desired look, and frost them all together with cream. Once ready, it will showcase a feel of the stuffed cake. 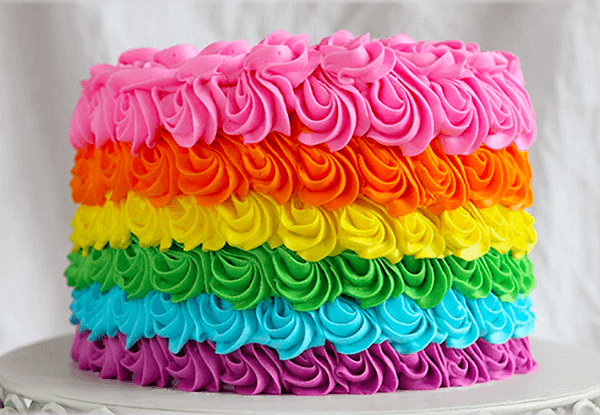 Prepare Colourful Rainbow Cakes: Colourful and multi-layered cakes are very popular these days, especially with the kids. On various occasions, the parents can try out preparing these pleasant multi-layered cakes. Make a Fruit Loaded Healthy Cake:For health-conscious cake lovers, the latest entry to the list is fruit loaded cakes. These cakes give you the pleasure of any regular cake with its moist and soft bread, but only minimal cream is used during the frosting. In fact, the bread is covered or loaded with freshly sliced fruits in this cake. 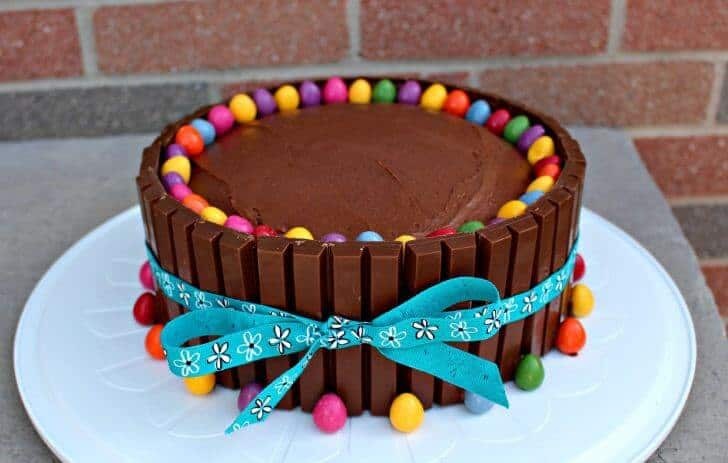 Play with Jellies, Candies or M&Ms: Again very popular with the kids, some cakes are either decorated or stuffed with jellies, M&Ms, and candies. These cakes look very pretty and taste wonderful too. 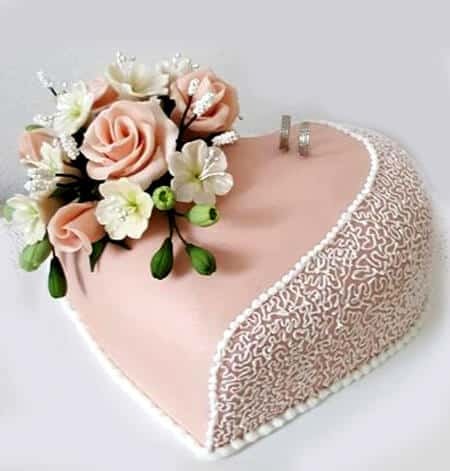 Heart Shaped Cake for Your Loved One: Birthday of your partner or anniversary or even the celebration of Valentine’s Day becomes complete if you get a heart shaped cake on the occasion. To prepare such a cake, you must have a special heart-shaped pan. If you are preparing a cake with a bunch of cupcakes, try adjusting the cupcakes one above the other, and you can give your cake the look of a castle. While decorating your cake, you can also play with some flavored ice-cream on the top. If the cake is meant for your kid, try preparing one in the shape of his favorite cartoon character, farmhouse, his favorite book, a pirate ship, an animal or a playground etc. Try decorating your cake with chocolate chip cookies. Though it may sound a bit conventional or old – but never outdated. People always relish the taste of a cake clubbed with choco-chip cookies. Another wonderful item to the club with your cake is a donut. If your kid is fond of donuts, your idea decorating the cake becomes quite easy. If you are baking or even frosting a cake at home, always wrap the cake pan with “bake even strips”. If you do not have a “bake even strip” handy with you, try out wrapping with wet towels. This is done to make sure that your cake is being prepared in perfect flat layers. While baking, when the base is ready, drop the pan from some distance over the table or the slab. This ‘throwing’ activity helps in busting any air bubbles present inside the batter. If it is a fruit loaded cake, try out decorating it with fresh fruit purée. It adds a wonderful color to the cake and offers better taste as compared to food coloring. Before frosting, your cake, try browning the butter. It makes even the simple frosting look tempting. While frosting, cover the sides of the cake too with extra layers for better look and feel. Always remember that the cake you are going to present in front of everyone, at your celebration, is certainly going to be the centerpiece. 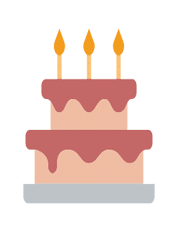 Therefore, if you lack confidence in baking one yourself, it is always recommended to order a birthday cake or anniversary cake online from a reputed and trusted cake bakery near you. Cake experts like ‘Doorstep Cake’ have been following the latest trends in the industry when it comes to preparation, flavors or the designs of the cake. Be it a number cake, a photo cake or even a heavy multi-layered cake, visit Doorstep Cake and choose your desired one. You have the privilege to avail the facility for midnight cake delivery at your home now! !